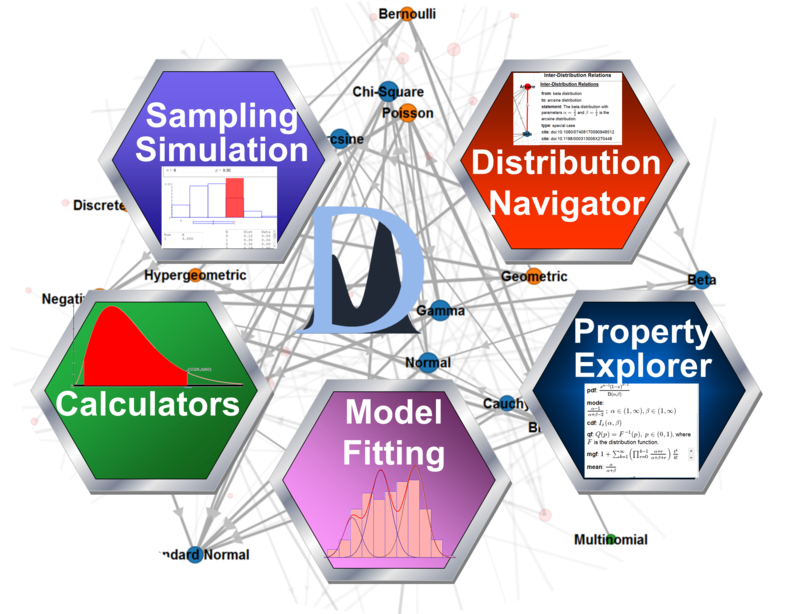 The Probability Distributome Project is an open-source, open content-development project for exploring, discovering, navigating, learning, and computational utilization of diverse probability distributions. A probability distribution is a function that assigns probabilities to events. For example, flipping a fair coin generates 2 possible equally likely outcomes (head and tail), and rolling a single loaded 6-face die generates 6 possible outcomes, each having a chance to be observed proportionally-equal to the die’s loading factors. Usually, a probability distribution function is defined in the context of a random variable, or a vector, and provides likelihoods that the random variable may be observed within a specific sub-set of the space of its possibilities. For instance, throwing a dart at a dartboard generates a score (integer value), indicating the landing location’s proximity to the center of the dartboard (bulls eye), which naturally leads to a definition of the probability distribution of the dart landing in a specific area. Probability distributions are mathematically rich objects that give rise to other mathematical functors. Depending on the nature of the space where a probability distribution is defined (discrete, continuous, univariate, multivariate, Euclidian and non-Euclidean, etc. ), it naturally leads to various functors like probability mass or density function, distribution function, quantile function, probability and moment generating functions, and so on. In its most general form, a probability distribution is defined as mapping between a measurable space and the unitary interval. Discovery of references and additional distribution resources. Interactive utilization of various probability distribution calculators, simulators and experiments.